Many economic theories depend on the presence or absence of a unit root for their validity, and econometric and statistical theory undergo considerable changes when unit roots are present. Thus, knowledge on unit roots has become so important, necessitating an extensive, compact, and nontechnical book on this subject. This book is rested on this motivation and introduces the literature on unit roots in a comprehensive manner to both empirical and theoretical researchers in economics and other areas. 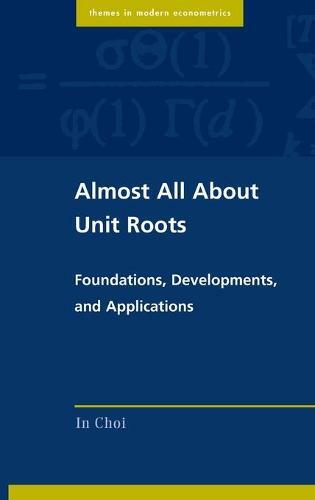 By providing a clear, complete, and critical discussion of unit root literature, In Choi covers a wide range of topics, including uniform confidence interval construction, unit root tests allowing structural breaks, mildly explosive processes, exuberance testing, fractionally integrated processes, seasonal unit roots and panel unit root testing. Extensive, up to date, and readily accessible, this book is a comprehensive reference source on unit roots for both students and applied workers.